Although our planet is currently facing some serious environmental crisis, it is relieving to see that some technological solutions, which aim at saving energy and thus reducing carbon emissions caused by production of electricity, have actually become comparatively popular and even casual. More and more house-owners are willing to take up the challenge and power their homes with some of the alternative energy sources. One of such useful sources of power is solar energy. Solar energy is collected by solar panels that in most of the cases are being installed on rooftops. In such way, not only private houses but also many offices and government institutions are providing the energy for their premises from their own source without using the energy sold by large electricity companies. There is plenty of information available on what sort of panels to choose for every particular case, yet there seems to be lack of proper information about the maintenance part. “Do I have to clean my solar panels?”, “Can I clean my solar panels or I have to call a professional to work on this?”, “Is it even important to clean the solar panels if they are on the roof?” are the questions that many solar panel owners are seeking answers for. This article should help you to clarify some of the things related with these, in fact, uncomplicated and easy-to-be-solved matters. The currently available information and opinions on solar panel cleaning are quite controversial and do not provide one universal answer. There are some people claiming that there is no need to clean your solar panels especially if they are located on the roof. The main argument here is that rain and wind will simply take care of all the dirt accumulated on your panels and that it is basically unnecessary effort, as well as extra time and costs for you to clean something that is already clean. On the other hand, there are solar panel users that claim to have benefited from cleaning the solar panels once in a while. Actually, when doing the research and contacting solar panel owners, you will see that the latter ones are the majority and thus we can make a very simplified conclusion: cleaning your solar panels DOES matter and doing it a few times per year can significantly improve the efficiency. However it does not mean that the former ones are lying or simply being too lazy to do the job. The impact on panels’ performance after cleaning them varies significantly due to numerous factors. One of them is the type of solar panels you have installed. Tiled rooftop panels will surely have a great deal of the cleaning job done by the nature forces – wind and rain, whereas flat solar panels will accumulate a lot more dirt. All the dirt such as dust and bird droppings surely prevents some amount of sunlight to reach the solar cells which further on produce the electricity to be used in the house. If you live in an especially dusty area (e.g. near to a highway or factory) and, due to climate specifics, you don’t get too much of rain and wind during the year, the performance of your solar panels will most surely worsen and you will not be using it up to its maximum efficiency, unless you take care of cleaning them once in a while. In fact, there are some studies that show that solar panels that are cleaned at least once a year produce up to 5% more electricity than those that have never been cleaned. Some inspections have reached a conclusion that the efficiency of cleaned panel had improved for 25% compared to what it was before the cleaning was done. You might think that cleaning the panels will only add up to your costs but actually the process itself does not require neither too much money, nor time or effort. As said, the easiest way of dealing with dirty solar panels, is simply to schedule at least two times per year, let’s say in spring and autumn, to do this job. Since it is not more difficult than cleaning your car or windows, it will not take more than just a couple of hours of your time. With these three cleaning tools, it will be enough to do the cleaning. Simply wash and swipe the dirt off the panels, rinse with water hose until they are clean again. Of course, since the panels are most likely located on the rooftop, you have to be particularly careful when working up there. If you are not sure if you can deal with this task in a safe way or you simply have no time for this, you can always order services of professional solar panel cleaner who will do this job for you. Another even easier but also more expensive option is to buy a cleaning robot. 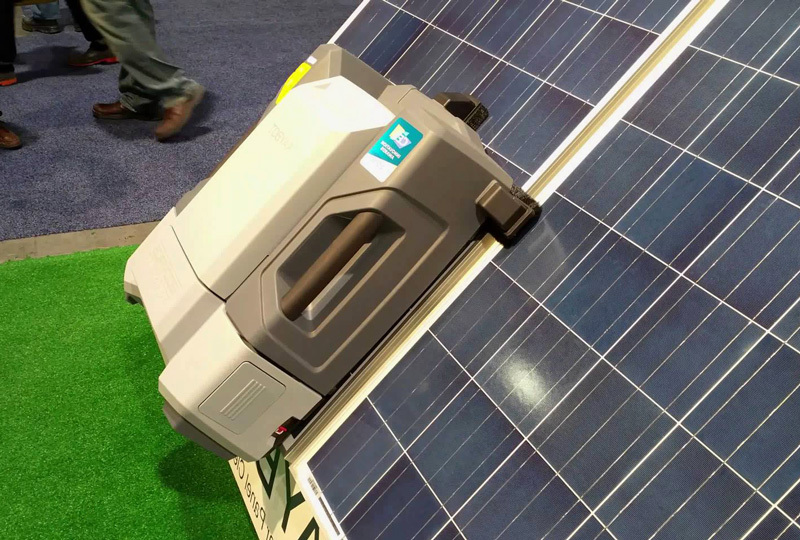 There are some really good companies out there such as Mitsubishi, Sanyo and Santech who are manufacturing robots that are specialized in cleaning solar panels. Of course, if money is not an issue, you can also buy newest generation solar panels with built-in self-cleaning technology. With this, you will not have to think about any solar panel cleaning issues for years. Whereas it can be visually seen whether your panels are dirty or not, there is always a possibility for you to upgrade the whole process up to a new level and involve monitoring service which will measure the performance of your solar panels and indicate when the energy production could be decreased because of the dirt and dust. No matter which option you choose, one thing is clear – having clean solar panels means using them in their optimum efficiency. By having your panels furbished once in a while you will lose just a bit of effort but instead will save notable amount of money which would be simply wasted by not producing as much energy out of your solar panels as you could. I just got some solar panels installed on my roof and was wondering if I needed to clean them. Thanks for the advice about how solar panels that are cleaned at least once a year have 5% more electricity. I’ll have to see about getting someone to come a clean my solar panels. If you just installed solar panels on your roof top there is no need for cleaning them, as they will definitely work at their full potential. You should consider cleaning them after the first season or if the weather at your area has been extremely harsh. You mentioned that the easiest way of dealing with dirty solar panels is simply to schedule at least two times per year, let’s say in spring and autumn to do this job. Do the panels need to be cleaned more often if you live in a certain climate? My neighbors have solar panels on their roof and don’t really know how to clean them. Hiring a professional to come and clean them might be a good idea. It depends on the area. If you’re living in a very dusty area, you might need to schedule a maintenance more often, basically you’ll need to monitor the efficiency of solar panels. Once you start to see a decline in their efficiency and also notice that they have gathered a visible layer of dust and dirt, you should either clean them by yourself or hire a professional cleaning company that will do it for you. Thanks for this! I have heard that cleaning them can actually improve efficiency! Is that true? And I also wanted to say thank you for telling me how to clean them. I never knew that it was as simple as a brush with soapy water! Glad you found our article helpful, Jay! 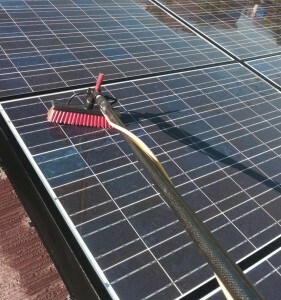 And yes clean solar panels do produce more power than dirty ones, so cleaning them once in a while can be beneficial. Considering how important solar panels are for keeping your home powered and off-the-grid you will want to make sure that you are properly maintaining and cleaning them. As the article points out, some parts of cleaning a solar panel can be as simple as using soap and water. However, if you have a lot of solar panels, and use some of the more complex ones, then you might want to hire a professional service to take care of the regular cleaning and maintenance. Next story What is Solar Lighting and What are its Advantages? Previous story What are Incandescent Bulbs and How do They Work?